Final Meeting coming up soon: We are looking forward to seeing all project partners at the final meeting taking place in Bergen between 19 and 22 January 2015. Science-policy event: On Tuesday, 20 January 2015, there will be a science-policy event on “10 years of ocean carbon and climate research in Bergen”. View the flyer for more information. Third periodic and final reporting: Guidelines and templates have been added to the Partner’s area. Final CARBOCHANGE Meeting, 19-22 January 2015: Registration will remain open until 14 November 2014. Final CARBOCHANGE Meeting, 19-22 January 2015: View the meeting website for more information. Registration is now open. Final CARBOCHANGE Meeting, 19-22 January 2015: The draft agenda has now been added to the website. Registration is anticipated to open in October 2014. Final CARBOCHANGE Meeting, 19-22 January 2015: Please visit this website for more information. Registration is anticipated to open in October 2014. Final CARBOCHANGE Meeting: The final project meeting will take place in Bergen between 19 and 23 January 2015. Please stay tuned for more details. 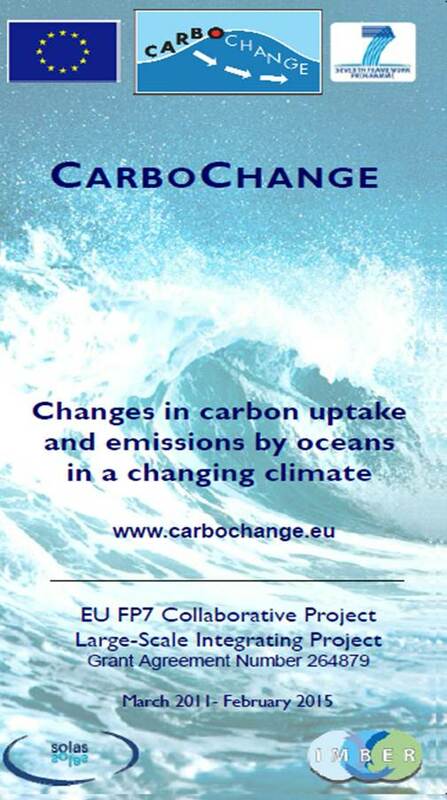 Final CARBOCHANGE Meeting: The final project meeting will take place in Bergen between 19 and 23 January 2015. More details will follow soon. Next Reporting Period: Deadlines, guidelines and templates can be found here – Periodic Reporting 2014. Next Annual Meeting: The meeting will be held between 07 and 10 April 2014 in Reykjavik, Iceland. Next Annual Meeting: The meeting will be held between 07 and 10 April 2014 in Reykjavik, Iceland. Registration is now open! Next Annual Meeting: The meeting will be held between 07 and 10 April 2014 in Reykjavik, Iceland. Registration is now open! More information can be found here – 3rd Annual CARBOCHANGE Meeting. Next Annual Meeting: The meeting will be held between 07 and 10 April 2014 in Reykjavik, Iceland. More information can be found here – 3rd Annual CARBOCHANGE Meeting. Next Annual Meeting: Please note that the meeting will already start on 7th April 2014 and will end on 10th April 2014. More information can be found here. Several new CARBOCHANGE publications are now available online. Have a look! CLIMMOD (France) joined the CARBOCHANGE consortium as a new partner. Welcome! Several CARBOCHANGE scientists have contributed to the Carbon Budget 2010: An annual update of the global carbon budget and trends. The Surface Ocean CO2 Atlas SOCAT version 1.5 is publicly released!! !